When I'm working with clients on social media strategies, I often find myself reminding them that social networks and mobile devices are no different from the technology of yore. They're the medium, not the message, and your long-standing communications skills still apply. And I have no better reminder of that than the social media skill I use every day: Touch typing. Yes, that's right. You probably already know I'm not a digital native. More like a long-lived, adaptable, evolutionary Galapagos tortoise with mad social media skillz, if the truth be known. Touch typing could not be more old school. Seemingly, it's out of date. Yet I use it every day, all day, fulfilling a defiant prophecy I made in high school. A teacher who also managed the honor society wanted to talk me out of taking a full-credit typing class. She kept suggesting other, "more intelligent" classes. 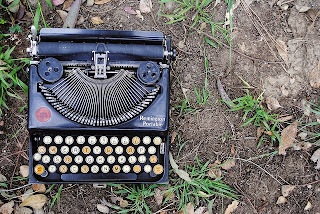 But knowing I was barreling toward a career as a writer, I turned down each option saying, "I may not need that, but I'll be typing every day for the rest of my life, and I want to learn it now." By the time I was done with that high school typing course, typing was a part of my DNA. I worked my way through college with it, as work-study secretary to a great broadcasting professor. A college friend just reminded me that she associates images of me typing with the movie Julia, in which Jane Fonda, playing author Lillian Hellman (a favorite of mine) threw a typewriter out the window in frustration. For the record, I never got that far, but you can always feel free to compare me with either Fonda or Hellman. And the typewriter I used in college was a beast. If I'd thrown it out the window, casualties would have occurred. Today, I use lots of tools to keep up with my social media publishing presence, which includes three blogs that together post six times every week; two Facebook pages; several Pinterest boards; two Twitter feeds; a Google+ account and blog community; a LinkedIn presence. And while I rely on Blogger and IFTTT and a host of other tools, I couldn't sustain all that in the compact number of hours I do without touch typing. I can do it eyes closed. I can tell when I'm making a typo or my fingers haven't hit the keyboard in the right spot. And I'm still close to 100 words a minute when I can type uninterrupted, which means I also can transcribe fairly well when needed. A college professor friend of mine shared that her students had gone back to hand-writing notes in class, because they don't know how to touch type and can't keep up on a laptop. Take that, high school teacher. The clever reader will notice that I'm hanging on to a typing skill, and not the typewriter itself. While I love seeing them, using them was another thing entirely. Maybe we'd all be better off if we stopped yearning for ancient technologies, but hung on to the skills that are universal enough to move forward with us? If you're feeling pangs of nostalgia for your typewriter days, there's an app that emulates what typing was really like to talk you out of that reverie. Apply as needed. Check out the typewriter-throwing scene in the Julia trailer below, and type on!